Mudeungsan’s gradual slope makes it an easy climb for all. Locals once worshiped Cheonwangbong Peak as it was considered a mountain of God. Among the more majestic of these sites are the Seoseokdae, Gyubong, and Ipseokdae peaks. At the base of the mountain are several famous temples including Yaksaam, Jeungsimsa, and Wonhyosa. Mudeungsan Mountain is also known for its beauty throughout the year. 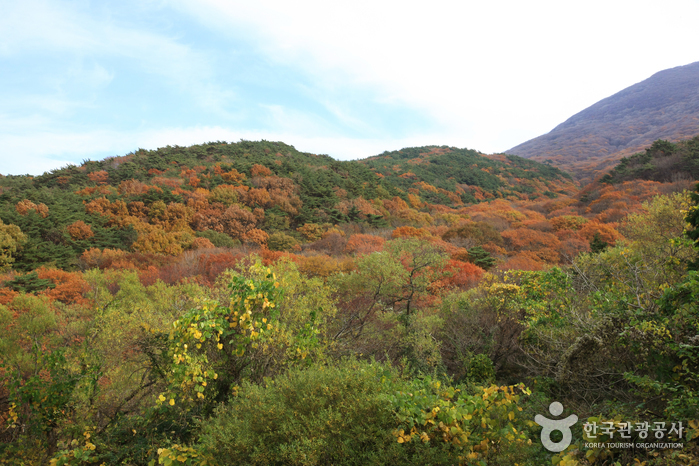 The fall autumn leaves of Gyubongam and eoksae grass of Baekma Ridge are quite spectacular. In the winter, snow and ice on the mountain create exquisite scenery as well. Below the mountain, there is a variety of recreational facilities and tourists sites for visitors. This includes Gwangju National Museum, a traditional Korean style building with exhibition space and artifacts on display. These items total 2,000 artifacts and include treasures excavated from the sea of Sinan, items from Honam province (made during the Seonsa, Baekje, and Silla periods), and paintings from the Joseon Period.